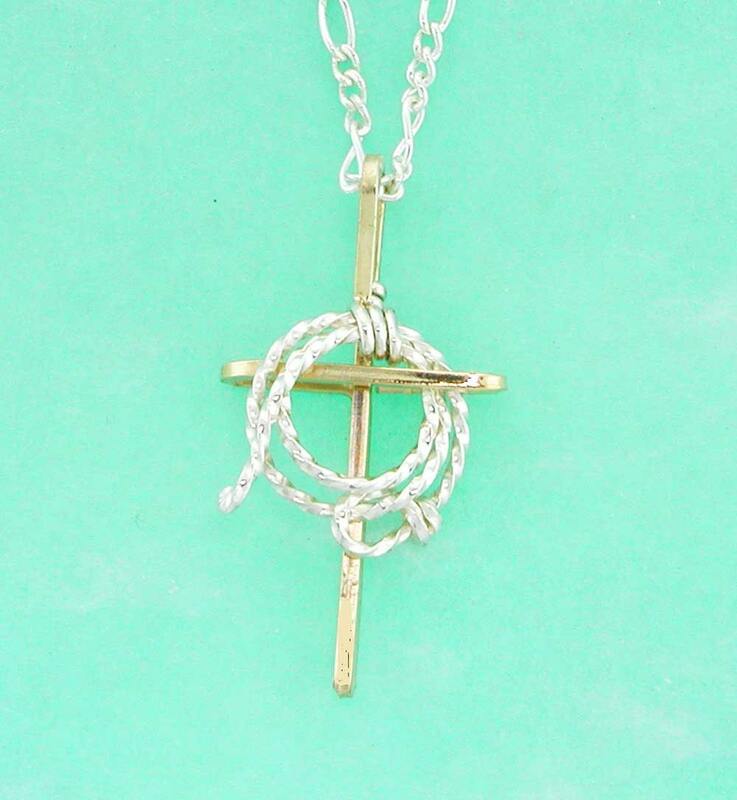 Each Unique Lariat Cross Necklace is make by hand in Sterling Silver and 12 karat Gold Wire. 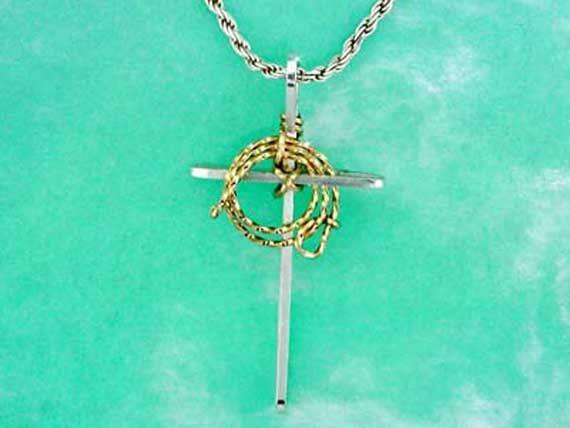 The silver cross with gold lariat comes with a gold filled chain. 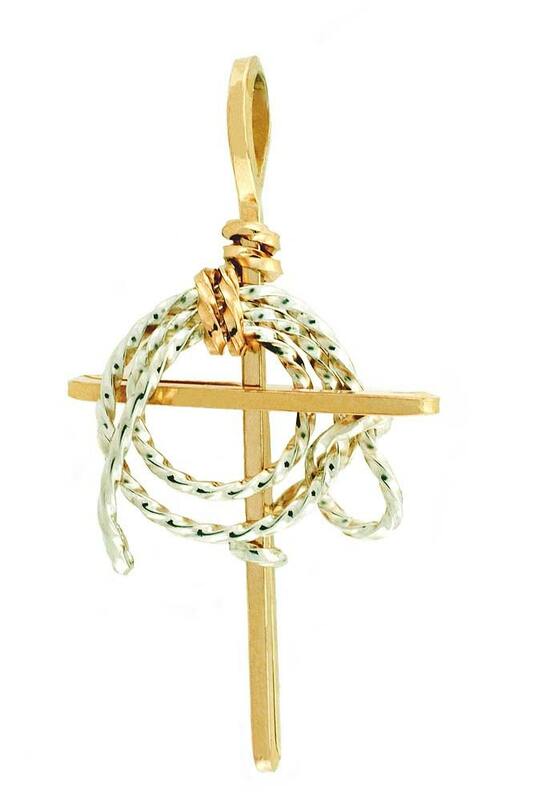 The gold cross with a silver lariat includes a sterling silver chain. The Cross is approximately 1 1/4 inches tall and the contrasting lariat is wrapped and tied to the cross. The pendant includes a 16 of 18 inch figaro chain in 14 karat gold filled or solid sterling silver. Much of our jewelry actually originates with our customers and this delightful piece was designed by a very sweet 10 year old boy. We were working the Equine Affaire several years ago when an older gentleman and his grandson came by the booth in search of a cross necklace for the youngster. While my husband, Jim regaled the grandfather with talk of old cars and sailing, I showed the boy what we had to offer in crosses. After a tour of the booth and explanations of how we could make almost anything he wanted, I left him to look and ponder what he really desired. After joining his grandfather again Jim asked if he had come up with anything we could make for him. His response was priceless and the design became a favorite in our booth. He looked up at Jim and said simply, "Well mister, could you take a cross and just hang one of your lariats over the top? PRICELESS We designed one from his idea and gave him the first one. And that's the rest of the story!